For inspecting your leaky submarine or snorkeling with the kids, here’s a handy toy. This mask’s built-in 8MP camera takes VGA video at up to 30 frames per second and accepts a microSD card up to 32GB for 20+ hours of video. It’s very easy to operate underwater, with just two big buttons (Still/Video/Off, and Shutter) and a simple status LED. Peripheral vision is blocked by battery compartments, and it’s not the smartest camera — above water, I found the image contrast varied greatly as my viewpoint bobbed between wave and sky. And it downloads its files very slowly via USB. But the advantages are obvious; no separate GoPro to fool with, no helmet mount needed, just grab your video mask and plunge in. 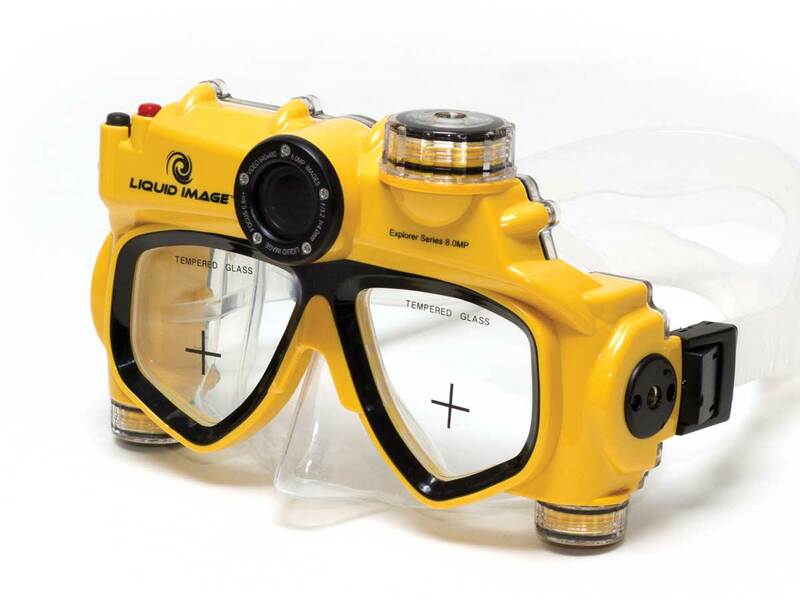 This one’s rated to only 15 feet; for deeper dives and better images, consider the 12MP wide-angle Scuba series, rated to 130 feet, with HD 720P video for $200, or HD 1080P for $300.